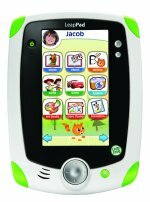 The LeapPad is a $100 learning tablet for kids that can play apps (games, ebooks, videos and flashcards) downloadable from the LeapFrog store. The LeapPad also supports more robust learning games called Learning Game Cartridges which plug into the top of the device. But the showpiece for this new tablet is a new type of digital book called LeapPad Ultra eBooks. LeapPad's 5-inch screen is substantially smaller than the iPad's 9.7-inch version, but the screen is housed in a durable casing which is designed to withstand dropping. Kids can use their finger or an included stylus to interact with the touch-sensitive screen; and the tablet also supports motion-sensor game controls because it contains an accelerometer. The tablet comes with a built-in camera and video recorder, and 2GB of memory. It can house 30,000 photos or 120 minutes of video. It also has its own microphone to support voice commands and recording. It uses four AA batteries, and it will support rechargeables. An optional AC adaptor is available via separate purchase ($9.99). The LeapPad comes with a creativity suite that includes an "Art Studio," a "My Stuff" gallery and "Story Studio: All About Me." Kids also get to design and play with their own pet in the included PetPad app. When first attached to the computer, kids can download one free additional app; and the device will sync to the LeapFrog Learning Path, which is a service that allows parents to get feedback about what their kids are learning and suggests new apps and games. The "Art Studio" is standard stuff with blank canvases and virtual brushes, pencils and stamps. What is cool is that you can zoom in on a section of your painting to work on details. You can also save your painting to come back to later and resume your work. The "Story Studio: All About Me" lets you incorporate your photos or videos into stories. It provides a template to help kids get started expressing themselves. 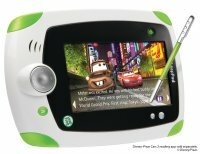 The LeapPad is backwards compatible with much of the content created for last year's handheld Leapster Explorer, including Learning Game Cartridges, downloadable game apps, ebooks, videos, and flashcards. That library combined with the new content that LeapFrog is adding around LeapPad's release provides parents with over 60 items to choose from. We tested one of the new Explorer Learning Game Cartridges called "LeapFrog Explorer: I Spy Super Challenger" ($24.99) for kids ages 5-9. It offers five different kinds of brain-teaser puzzles, each with 50 rounds. Kids can explore traditional "I Spy" puzzles of hunting through crowded scenes to find objects hinted at in the riddles. This part of the game is doable but frustrating, because the riddles don't stay on the screen while you are hunting. However, the other four puzzle-types worked brilliantly on the LeapPad, and will provide kids with 200 rounds of stimulating problem-solving. In one, kids divide groups of objects into sets of equal values by drawing lines on the screen. Also good was the new downloadable learning game app called "Roly Poly Picnic," which costs $10.00. It is a game that makes use of the LeapPad's accelerometer; you tilt the device to direct cute little bugs (that roll up into balls) through a series of mazes, collecting consonants and spelling challenges as you roll. Unique to this device are the new "LeapPad Ultra eBooks." These digital books incorporate interactive cinematics, learning games, the highlighting of words as read and the adjustment of a reading level based on how kids play. Costing $20, "Disney Pixar Cars 2: Project Undercover" Ultra eBook, for ages 4-8, features delightful video sequences showing Mater and Lightning McQueen. When the graphics are tapped, things happened on the screen and characters talk. If you tap a word, it is spoken aloud and sounded out; and some are even defined. Parents can easily adjust the level of reading by tapping the "+" button and then can watch how the story is delivered with a different use of language. The LeapPad remembers what level your child is reading at when he or she next reads an Ultra eBook. Here's the bottom line: With over 60 apps, games, videos, flashcards, ebooks and Ultra eBooks to explore, the LeapPad can provide kids with hours of entertaining learning. It costs considerably less money than buying an iPad and is more durable. However, its add-on content, ranging in price from $5 to $24.99, costs substantially more money than learning apps found in the iTunes app store. For families who have young children and aren't ready to invest in an iPad (or don't trust their kids with their prized iDevice), this is an excellent alternative if you don't go too wild with the add-on content.